Ex-England captain Alan Shearer says Wayne Rooney should be selected for the 2012 European Championship despite receiving a three-match ban. 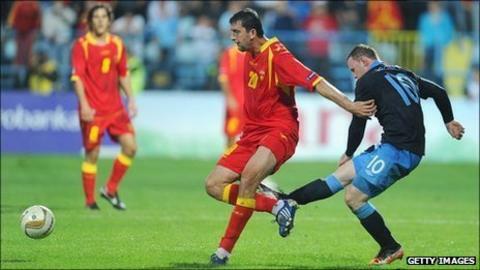 Rooney has been punished for kicking out at an opponent in the Euro 2012 qualifier against Montenegro on Friday. The Football Association plans to appeal against that verdict but Shearer says he would pick Rooney to go to the finals even if the ban is not reduced. "I think anyone else maybe not, but he is England's best player," he said. "There's a huge incentive for four or five strikers to stake their claim to get his place - they've got a great carrot dangling between now and the end of the season. "If they do well enough in the friendly games, then who knows, England manager Fabio Capello might decide not to take Rooney. "But if it were me at this moment, he is our best player and even if the three-game ban still stands, then I would take him." Shearer, who was capped 63 times by England, said he was not surprised by the three-game suspension given to Rooney for the red card that followed his kick at Miodrag Dzudovic in Friday's 2-2 draw. But the former Newcastle and Blackburn forward believes England are good enough to make it to the quarter-finals in Poland and Ukraine even without Rooney. Fellow former England skipper Terry Butcher described Rooney's ban as "the most painful blow possible" to their Euro 2012 hopes. He told BBC Sport: "To get three games is desperate news for England. Capello's heart must have fallen through the floor the moment Uefa's decision was announced. "England do not reach anywhere near the same level without Rooney, so this is the worst news you could imagine for the team and Capello going into the tournament. "Rooney is central to Capello's team shape and methods. After finally tearing himself away from his beloved 4-4-2, Capello has used the Manchester United striker to great effect linking midfield and attack." "He must now prepare for crucial games and a potentially difficult group without the fulcrum of his team. "I would still take Rooney to Euro 2012 because he is so important. If it was pretty much anyone else you would say leave them at home, but he is such a vital player that you just hope England will get through and he is then available to try and make up for the damage he has done. "It's not as though this is down to injury or bad form. It was so avoidable, so stupid. Capello will be devastated and I'm sure Rooney will be as well, but this was always the danger after doing what he did. "Now he has inflicted the most painful blow possible on England's ambitions to do well next summer." Despite the gloomy news, Shearer added: "I'm sure Capello will look at it different forward options in the friendlies between now and the Euros. "He has Darren Bent, Bobby Zamora, Andy Carroll and Danny Welbeck, and for them there is a great opportunity to say 'Wayne has done wrong and I can take his place'." Rooney has had problems in each of the major tournaments he has competed in, getting injured at Euro 2004, being sent off in the 2006 World Cup, and having personal and ankle problems overshadow the 2010 World Cup. And Shearer thinks the overall tournament will be worse for his ban this time. "He's not had an easy ride when it's come to major tournaments and this one is no different," he added. "He'll feel like he has let everyone down, which he has done, but he has to accept the punishment. "Hopefully he'll learn from it. It's a huge blow for everyone and a huge blow for football because he's one of the best players around when he is on his game and everyone wants to see the best players in the big tournaments."